Those of you familiar with Slow Dragon Music‘s live activities, will no doubt have come across an article or two about Smashed @The Tams, even if you haven’t managed to make it to a show. For a year and a half now, we’ve been showcasing some of the best in the metal and hard rock underground. We think it’s high time to flip the coin and see what the punks have got for us. We previously filtered in some local bands from the scene, like The Eddies and Subvision, but the Trashed debut sees a full bill of punk bands come together. Opening proceedings, we have a new(ish) band of old(ish) faces. 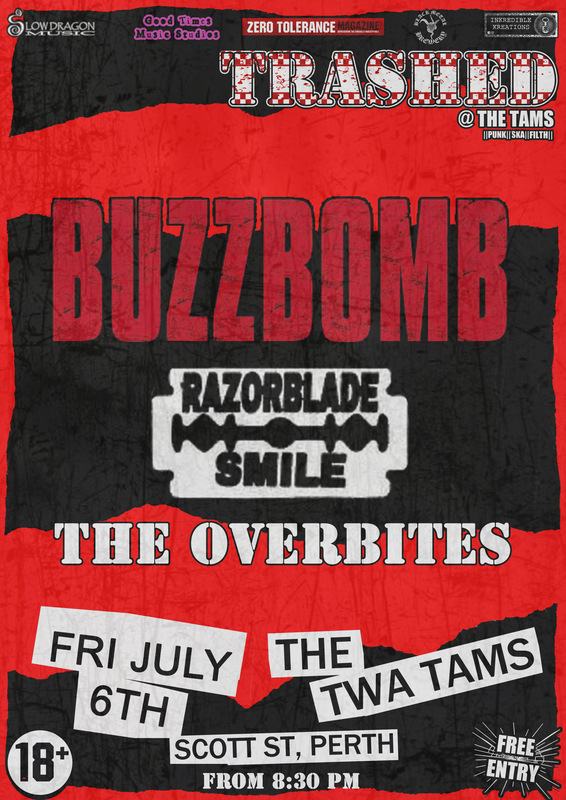 The Overbites, from Dundee, feature former members of Maxwell’s Dead and Salem Street/The Valens, playing energetic punk rock. Hailing from Glasgow, Razorblade Smile offer up some proper filthy old school for the middle of the show. This is traditional punk with a conscience, and a sense of humour. You can’t say fairer than that. Listing their influences as The Ramones, Social Distortion, The Misfits, and The Cramps, you know Buzzbomb are up for good time! Head on over to their Bandcamp page for a helping heaping of their latest, 60 Miles Of Bad Road. We’re ready for you. Are you ready for this? Posted in Latest News and tagged Black Metal Brewery, Buzzbomb, Good Times Music Studios, Inkredible Kreations, Maxwell's Dead, Punk, Razorblade Smile, Salem Street, Slow Dragon Music, Smashed, The Overbites, The Twa Tams, The Valens, Trashed, Zero Tolerance.